This past week in youth we discussed what worship is. Let me tell you. These students can totally blow my mind sometimes with the questions they ask. Be AWARE! This generation is not dumb. They aren't stupid, or just stuck on technology. Take a minute here. Listen to me. This generation is AMAZING! 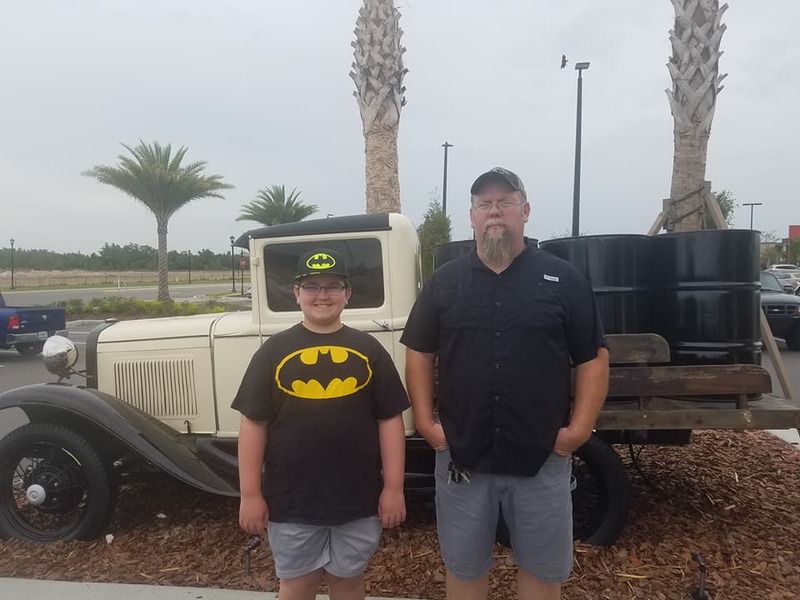 They ask questions and have thoughts that I didn't think till I was way older than they are. They are pushing their youth pastor and their leaders to step up their game. That's a GOOD thing. So, with that in mind, we have been having some crazy discussions lately. Mostly about what it means to have a relationship with God. To rely on Him fully and how we can do that. This week we focused on worship. What it is. What it is not. What we need to remember. Worship is giving reverence, and adoration to a deity. It is an act of expressing that reverence or "extravagant respect or admiration for or devotion to an object of esteem". Thanking God for EVERYTHING He has done for you. Even the tough times can be times of thankfulness and worship. Allowing God to speak to you. Shutting out the world, and actually listening to what He has to say. A lifestyle. It's not just singing and clapping on Sunday's or other "church" days. 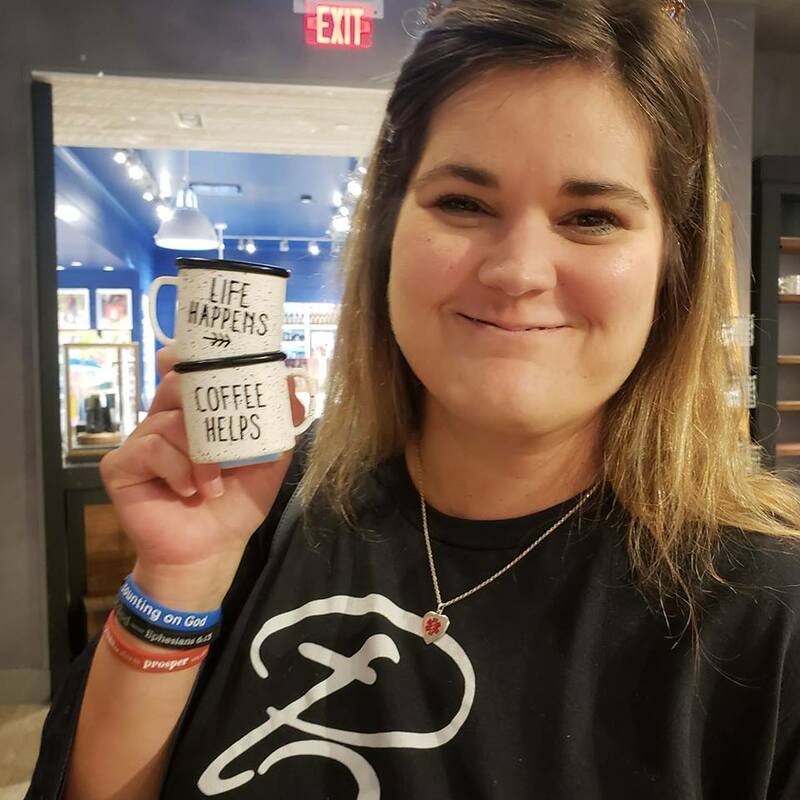 It is a lifestyle. You can worship in work, in deed, in giving, in everything you can do. Do it all unto Him! About you. It's not about how "great" you feel or how many goosebumps you got during the songs. Our focus should be on God, not on what us. A concert. Yes, God gives the musicians and singers talent and gifts. Yes they use them, but it's not about you saying how good the band was that day. It isn't a concert for you to enjoy. It should be an immersive experience that you participate in. A time filler. It's not to just waste time. It's an important part of the service or your day. When Joshua and the children of Israel were walking around Jericho, they blew the trumpets and shouted. That's when God took down the wall. David danced and didn't care what people thought of him as he worshipped God. He just knew God was worthy and he was going to give all his praise and adoration to Him. Paul and Silas were beaten, bloody, bruised, and chained in prison. Yet, they sang hymns and prayed. Right there in prison. That's when the earth shook, the chains broke and the doors flew open. Worship is warfare. Worship is intimate communication with your Father. 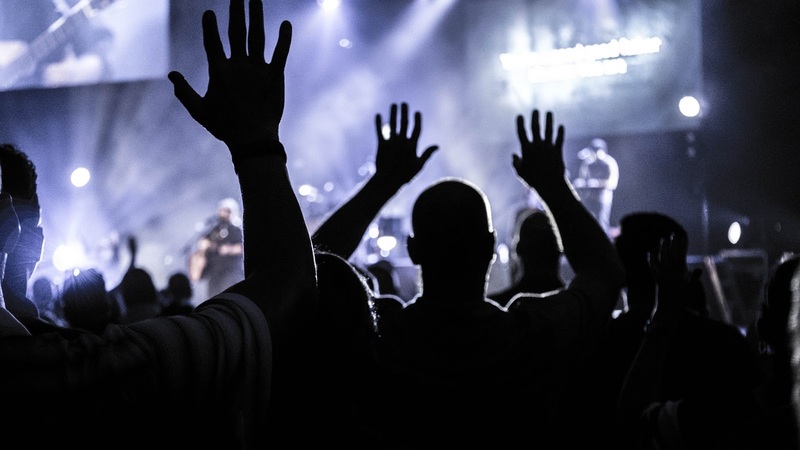 Worship can be loud, it can be silent. There's no right or wrong way to worship. I shared with the teens something and I'm going to share here. I believe in being transparent. I LOVE Bama football. If you know me, you know that. I'm not quiet when I watch a game. It's loud. It's noisy. I jump up and yell and shout. One day watching a game the Holy Spirit nudged me and asked me why I got more excited about a ball game than worship. 😐I mean yeah, I get excited but I still worried about what others thought. I've made up my mind not to do that anymore. Do I still feel "weird" or like people might laugh at me? Absolutely. But you know what... Jesus died for me. He took my beating, my punishment, my shame for me. The least I can do is be giggled at or looked at for worshipping Him. It can move mountains. It can give you peace and joy and remind you that God loves you and has you right where you are. 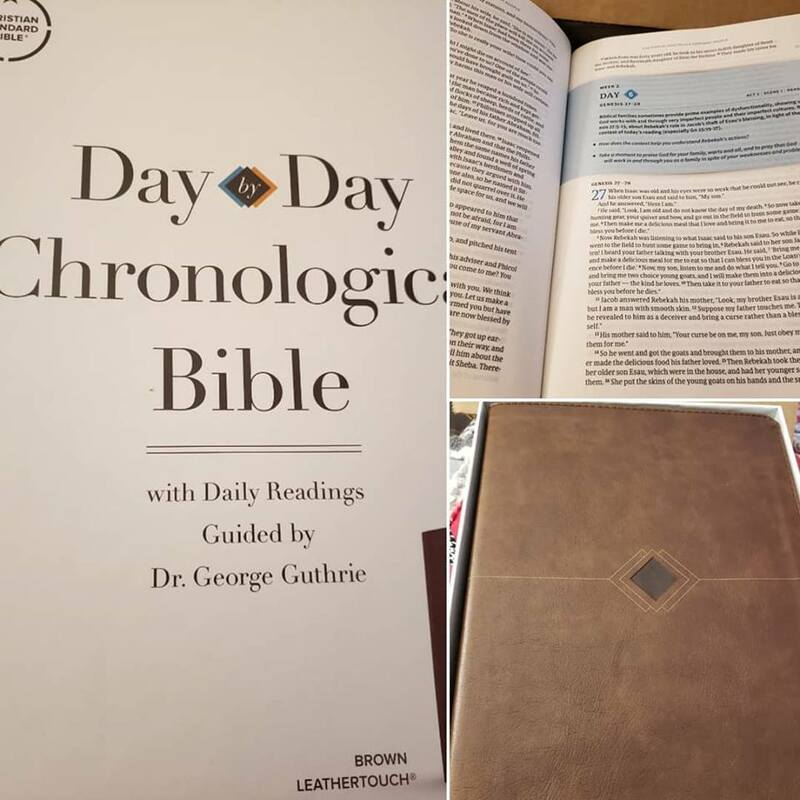 Day-By-Day Chronological Bible Review and GIVE AWAY!! Welcome! So glad you stopped by! 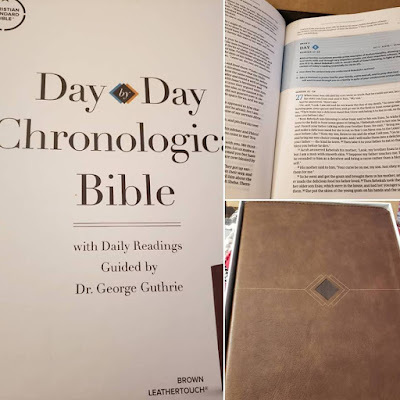 Today we're going to talk about an amazing opportunity I have had to check out a new bible release of the Day by Day Chronological Bible in CSB, Christian Standard Bible, format. I also am super excited to announce that Lifeway is allowing me to run a giveaway for one of YOU guys to win this very same copy like I have!!! But we'll get to that SOON! 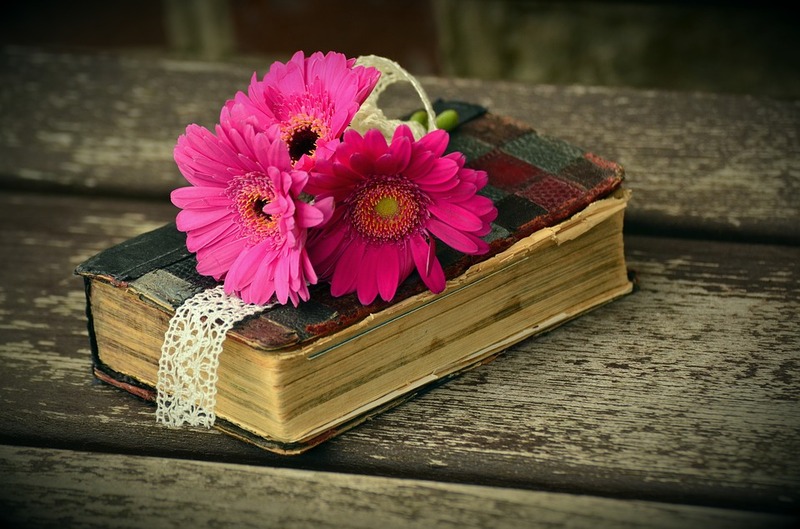 So, what is a Chronological Bible? Basically, it is a bible that puts the books of the bible and stories that we all know and love in chronological order. You probably know most of the stories and have possibly even read the entire bible. However, this option puts it all in chronological order of how it happened. So you're not going to have your traditional order here. It is going to seem to jump around all while tying the beautiful story of God and His love for you in a timeline. 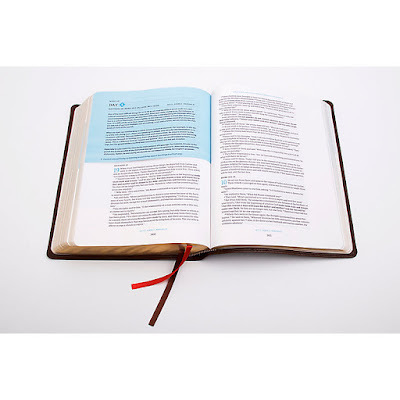 The bible offers a 52 week reading schedule that takes you through the entire Bible in a year if you follow their schedule. While most chronological versions start on January 1st and end Dec 31st, this bible doesn't have a set date to start. You can start at any point through the year and read on your schedule. 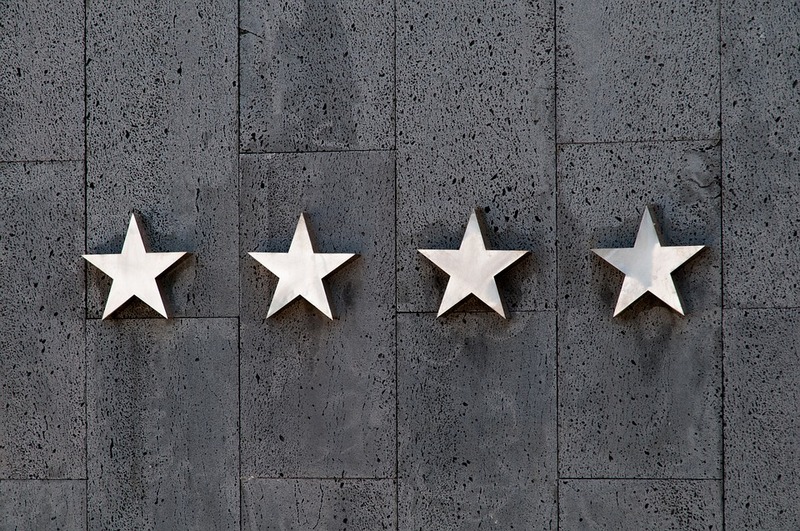 So, what is Christian Standard Bible Version? 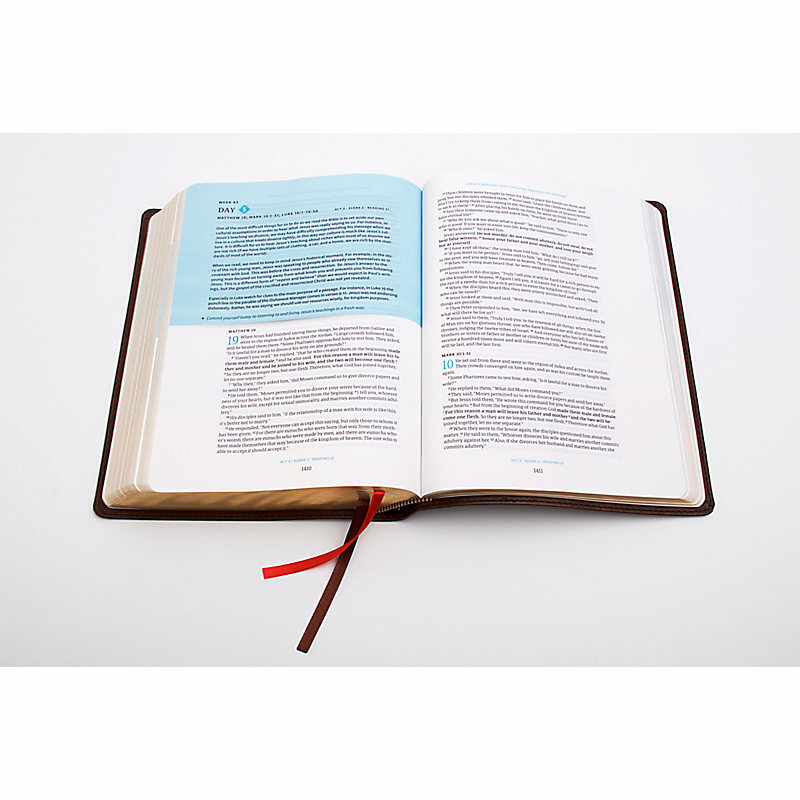 This version of the bible was written by 100 scholars from various denominations with the intent to make the bible easily understood. The focus was to draw readers in to a deeper relationship with God while not changing anything about what the original Word says. You can also find out more info on this particular translation by clicking here. The bible is structured in different acts such as you would have in a play or theater production you're watching. Each act has scenes that goes throughout the story of God. For example, you'll have a week and a day of the week to read a various set of scripture passages, each building on the ones previous to that day's reading. With this easy to understand translation and reading plan, you can read through the entire bible in 52 weeks. 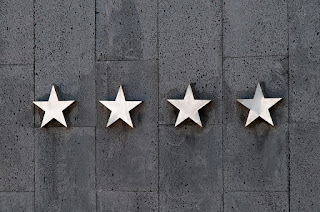 This can help you to stay focused, understand how the Word all ties together, and see the story of creation, God's love and redemption plan all fitting perfectly and seamlessly together. Last year was the first year that I have ever read through the entire bible, ever. In my life. I read a chronological bible plan on my phone app and it really helped me tie things together. 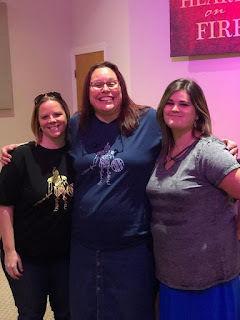 It was honestly eye opening to see how all these stories intertwine together and how the same stories are shared in multiple places in the bible. It helps to remind us that no matter what we're facing, God is always there and works for our good. I'm super thankful and excited to announce that Lifeway is also offering a giveaway of this same bible to one of my readers! You can enter the contest below and share with all your friends! Be sure to leave a comment below and let me know if you've ever read the bible chronologically before. What were your thoughts if you did? Thank you so much for stopping by and good luck on the entry form! I can't believe it's been almost a year since I wrote a post such as this one. That has to change... Life has been crazy busy the past 8 months and so much has gone on. 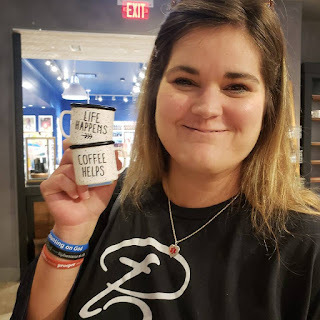 I'm planning on getting back to blogging if it is only to come in once a week and share the amazing things God has done for us. Which, in all honesty, that's why I do this anyway. To share what awesomeness God is doing in and around us. 860. I'm thankful for coffee and for the little wall flower thingy's from Bath and Body Works that know I love coffee. 861. I'm thankful for the AMAZING services we've been having at church for this past several months. It has been unreal what God is doing in our church and our community. In our individual lives and the changes I've seen personally. God is still in the business of healing, saving, restoring, refining, and renewing! 862. I'm thankful that God has blessed me with two amazing boys! Yes. One of them may be over 6-feet tall, but he is still a little boy at heart. I love these two and the relationship they are building this year. It has been awesome to watch them over the past several months as Boo Bear is growing into a young man and as Daddy is helping him. 863. I'm thankful for celebrating another birthday with this kiddo. 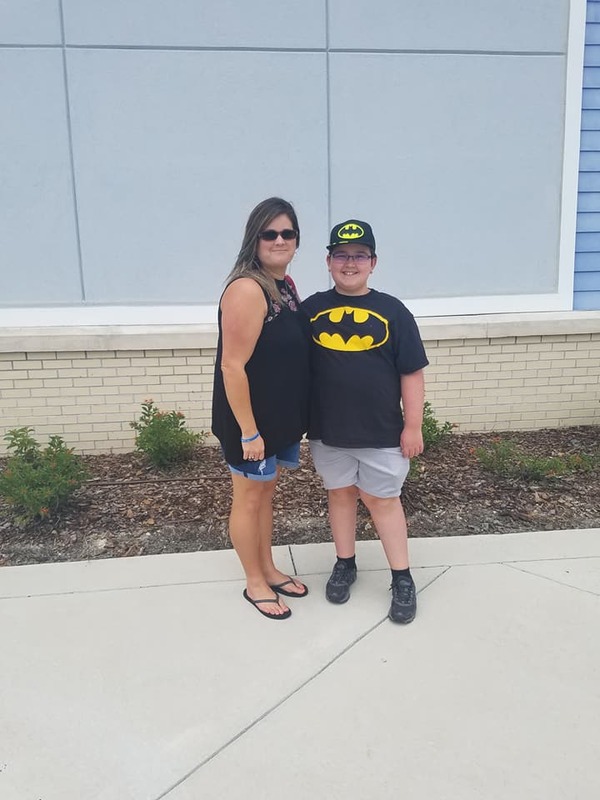 He's growing up entirely too fast for Mama's heart and I almost can't keep up. 864. I'm thankful for God's call on my life and that even when I thought I had wasted it, nothing is wasted. God still has a call and still has a plan, even when we fail to see it or don't catch on quite as soon as we should. He doesn't waste any experiences we go through and can use them for His glory. 865. I'm thankful for fun ink pens with bright colors that can help make writing fun. Even when I don't want to and my hand says, no thanks! 866. I'm thankful for the blessing of the books I need to finish my schooling, all the way through. Thank you to the one who blessed me with them and you know who you are! 867. I'm thankful for friendships that can stay connected no matter how many miles are between us. 868. I'm thankful for adventures coming up soon and some time away with family that is much needed! 869. I'm thankful for a team that I call family. That we work together in practice and on Sunday morning. That we lift each other up in prayer, give encouragement too and love. Faces change and people are moved down different paths, but that love and connection stays the same. Thank you Father for such an amazing privilege you've allowed me to sing and worship with this group! What are you thankful for this week? Share in the comments below! I have done reviews for Cave Tools before and they have fantastic products. This new addition is no different. This is a Stainless Steel Grill Pan that allows you to cook a variety of items without the fear of losing them in the grates. Let's face it. When you think of grilling, you don't typically think of cooking your eggs on the grill, do you? With this grill pan, you can do just that and so much more. 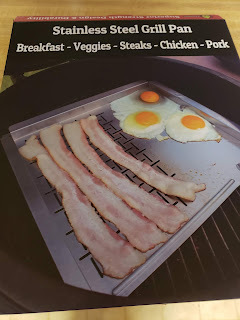 This grill pan allows you to cook a variety of items such as vegetables, eggs, meat and more without worrying about losing part of your meal into the charcoal or gas grill. This pan is specially made to offer perfect grill marks for those steaks and chicken that you want to char without them getting stuck to the grates. You can use this pan on a gas or charcoal grill and get perfectly cooked food every time. When you're looking for a healthier way of cooking your food, grilling is typically what comes to mind first. It gives you a great flavor without the added fat or oils that typically are used in cooking on the stove or in the oven. Grilling your food gives it a great taste and it allows you to get rid of some of the fat while cooking. This grill pan is made of a durable stainless steel material. You can tell from the moment you pick the item up that it is solid and made of a long-lasting material to cook all your food for years to come. This is a great item to take with you camping so that you can cook every meal right there at your campsite. The pan itself has handles on three sides so that you do not have to worry about losing your food when transporting it into the house. It offers ample cooking space to make sure you can easily get all your items cooked and finished at the same time. No more trying to time the inside side dishes to the outside meat you have cooking. You can do it all in one place and reduce the pans and pots you have to use. It's so easy to use this for cooking your favorite steak and veggie dinner on a Friday night. I'm very thankful that Cave Tools offered me the opportunity to check out this amazing pan! I recommend you try it out for yourself! If you're a camping family or a grilling family, this is a great product to add to your arsenal of cooking tools. It can help you get the entire meal done in one place while enjoying time with your friends and family. Thank you to Cave Tools for this review opportunity and let me know if you've ever used something like this before in the comments below! If you've hung around here long enough, you know that we love to cook and my hubby is the "Grillmaster". We love trying out new recipes and new gadgets to make that even easier to do! Gadgets not only make your life easier, they are also fun to incorporate into the kitchen. And if you have a guy in your life that loves to grill or cook, these types of things make great gift ideas (Father's day or Christmas anyone?). 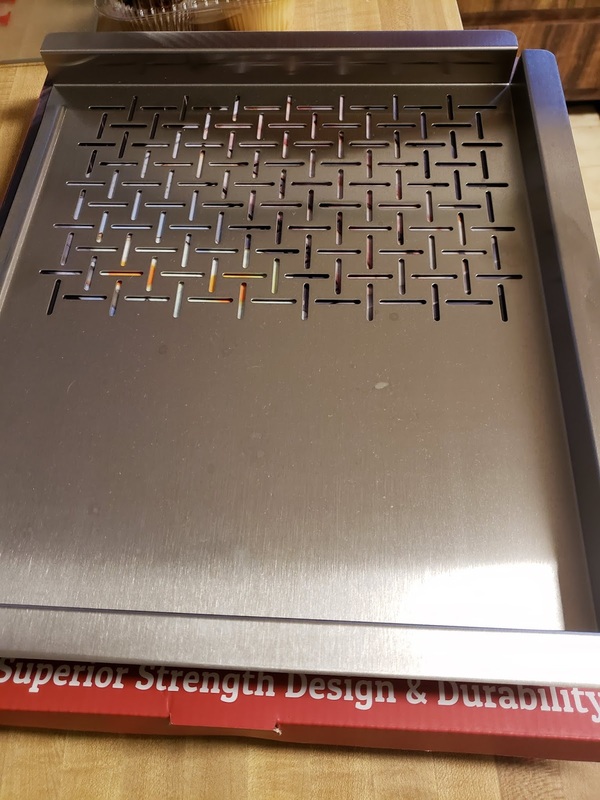 I've reviewed other products before from Cave Tools and this one is another great asset to have in your grilling arsenal. Introducing the Chicken Wing and Leg Rack. This rack is perfect for the grill or your smoker to ensure even cooking of these bone in pieces that can sometimes be hard to get even. Let's face it. Cooking chicken with the bone in tastes better but can be a real hassle when you're trying to time the rest of the meal and ensure the chicken is done completely all the way through. 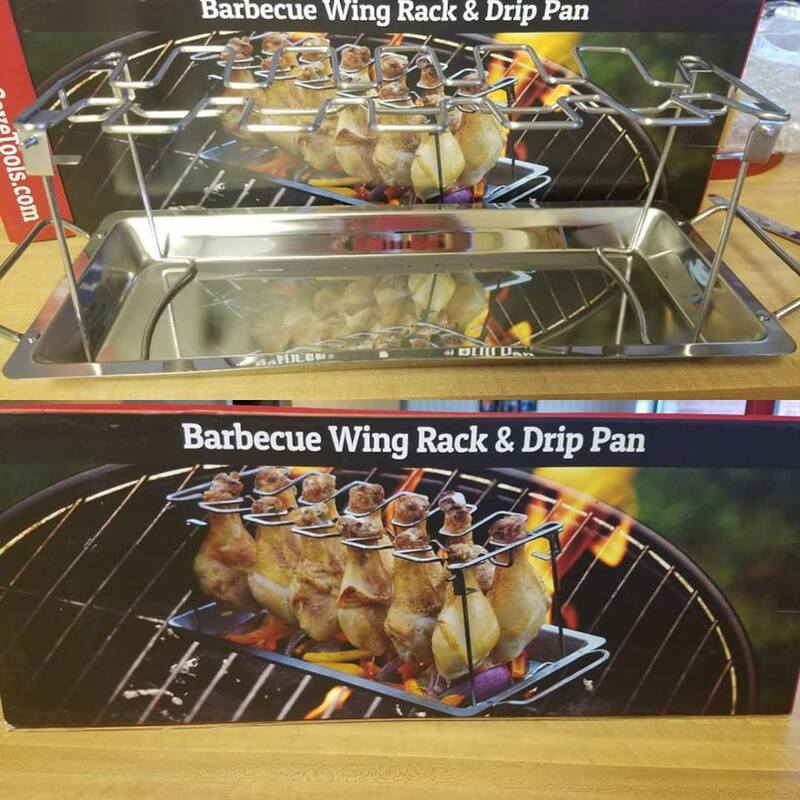 This rack makes it easy to not only cook your chicken to perfection, it also makes it easy to get your veggies done as well! 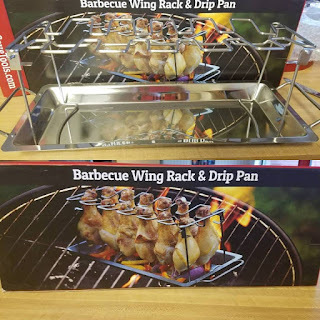 This chicken rack offers the capacity to cook 12 drumsticks at a time. You can also cook 12 wings or thighs all together. This works well in the oven too if you're not wanting to fire up the grill or smoker. 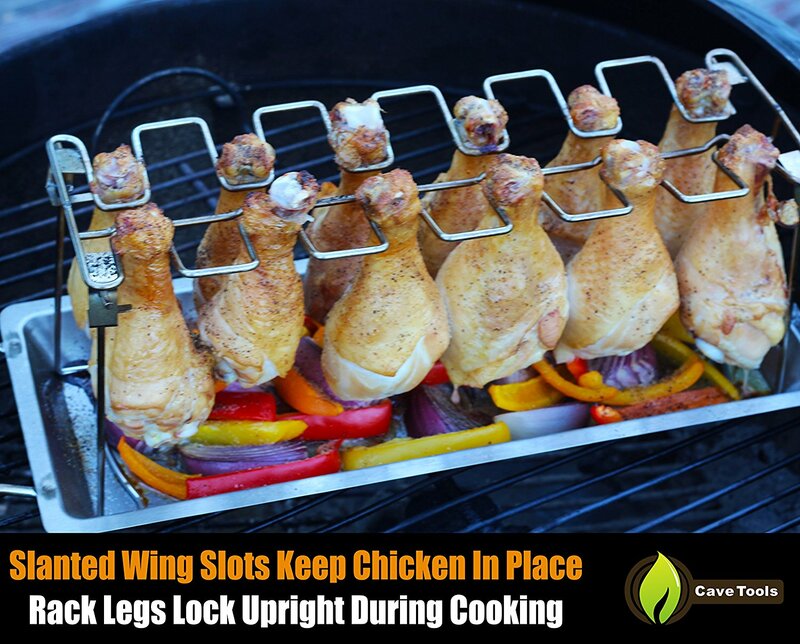 The legs on the rack are very sturdy and lock into place so there's no worry of it tipping over and losing your chicken in the process. 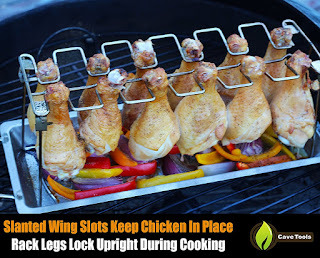 The drip pan that you see on the rack in the photo above helps to catch all those yummy juices and fats that will come out of the chicken during the process. This is a perfect place to throw some veggies or to collect the juices to make your favorite gravy to go along with your homecooked meal. One of our favorite recipes to use for chicken pieces such as legs and thighs is to rub them with olive oil and some of our favorite Cajun seasoning. It makes the meat delicious with a crispy skin on the outside. Lip smacking good!!! You can use a variety of recipes with your Chicken rack and if you're at a loss for what to do, just check out the awesome downloadable cookbook that comes with your rack as a bonus! You'll be able to experiment and find all your families new favorites with this easy to use gadget. So, I know some of you out there are probably like my husband. His tools and gadgets HAVE to be able to be washed in the dishwasher. If he's going to use it, he wants clean up to be simple and fast. Great news! This product and many of the Cave Tool products just like it are dishwasher safe! You can purchase the item on Amazon or on the Cave Tools website. You can use the coupon code: WING 15 to get 15% off of your purchase of the rack itself. If you're interested in this or other grilling/kitchen gadgets, I highly recommend checking on Cave Tools. They offer great products that truly do what they say they will do. So share with me... what's your favorite kitchen accessory that is a must-have? ABC's of God: The Letter "B"
This week's post is on the letter "B" and what words come to mind when we think of God. There were many great ones again this time when I requested "b" words and some of them, again, blew me away. I love doing this as sometimes I get "writers block" and can't think of words. It's always wonderful to hear what others have to share, what God means to them, what their testimonies are. So, if you have some other B words to add to this list, please share them in the comments below. I'd love to hear from you on your favorite B word to describe God or even what your word for "C" would be as it's coming up next! 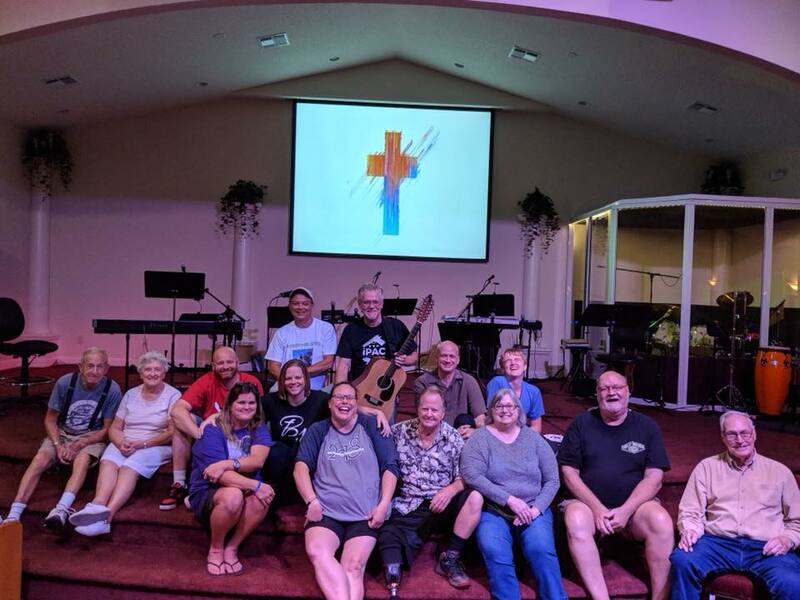 One person shared that God is BIG. He is. He can provide all your needs and even your wants. He is all powerful, all knowing, all wonderful! There's nothing impossible with God. This is meant as kind and well meaning towards others. God thinks good thoughts towards you and everything that happens, even the not pleasant things, are for your good. God has great and wonderful plans for you! This was one of my favorites! God is a beacon to all who are lost and wondering in this world. A bright light calling to come and find rest, peace, hope, and a future. Another of my favorites! God and life with God is better than anything this world has to offer! And there were lots more! When you stop and think about it, there are just so many words that can describe God and how amazing He is. God loves you. He died for you and He wants you to know the resurrecting power, grace, and peace that He has for you. 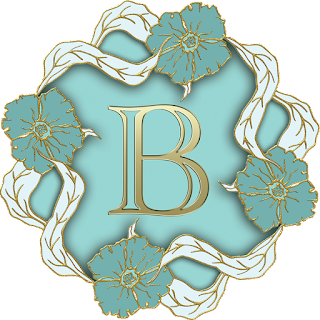 Share with me your favorite word to describe God that starts with a B. Keep on the lookout for the C list next week!!! I have been thinking and praying for some time now. One thing that has been on my mind was my blog and how I could continue using it to share the light of Christ with others. So, enter this blog series. I am setting out to do the ABC's of God. Words that go throughout the alphabet describing our Father or verses that we can relate to that particular letter. So, this week I asked my friends on Facebook what they would use to describe God with the letter "A". There were several wonderful words that everyone contributed. Words that I hadn't even thought of and that's one reason I asked! 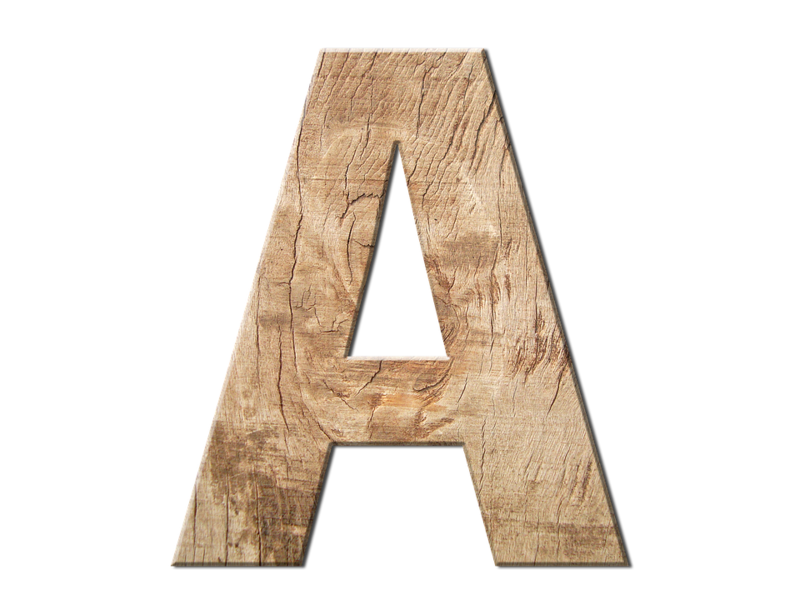 Many people said the "A" word that comes to mind is awesome, amazing, adored, and almighty. While all of these are so true and so very wonderful, I picked a few of my favorites to share today with you! So here are the "A" words to describe God. He has all authority over everything. "I know that You can do all things, and that no purpose of Yours can be thwarted"
This means the " highest form of love , charity". There's no greater love than this type of love and there's no greater love than the love the Father has for us. Jesus laid His life down for us. He came from Heaven to become sin for us, He who knew no sin at all. John 15:3 " Greater love has no one than this: to lay down one's life for one's friends"
God is not some high and lofty king that you can not approach. He is not hidden and He's not sitting far away. He is accessible to you in prayer, daily devotion, and the Word. He is always waiting to listen to you and hear your prayers. You have access to His throne room, His grace, His mercy all because of His son Jesus. When He gave His life on the cross, the veil was torn that kept everyone from entering into the most holy place. He gave us access to approach the throne, to receive grace and forgiveness, and to live eternally with God. We don't have to have someone do it for us. We can come to the Father and He's always there waiting for you. Romans 5:2 "through whom we have gained access by faith into this grace in which we now stand. And we boast in the hope of the glory of God." Proverbs 3:5-6 "Trust in the Lord with ALL your heart and lean not on your own understanding: In ALL your ways acknowledge Him, and He shall direct your paths." What words that start with A would you use to describe God? Comment below your favorite "A" word and share your thoughts. What do you think about the ones mentioned? Can you think of more? Visit Jennifer Ryan's profile on Pinterest.